Christmas was blissfully mellow here in the new home; no obligations, no worries, plenty of quality time with each other. 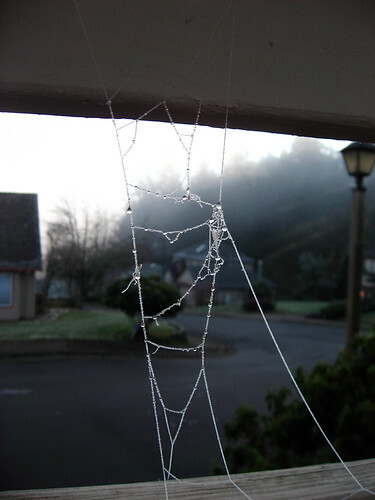 It was chilly, as evidenced by these gorgeous spider webs, encrusted in ice, on our porch. I love the way the drops of water froze like little glass beads. You should have seen how they glistened in the sunlight. If you go to flickr, you can embiggen them and see more of the detail. I tried my hand at sushi making, which turned out to be way easier than I expected. That's my "hot and sour tuna" roll. Recipe, inasmuch as anyone would need one, can be had if you click the pic. I mailed off both garments today and emailed the digital files as well. It feels so good to have those off the plate. Now, do I start something new or finish something already started? Yes, I know which is the RIGHT answer, that doesn't mean I'll do it. As I was falling asleep I had inspiration of another kind resulting in this, my first venn diagram. I'm sure this will improve your lives exponentially. And, in a last bit of late breaking news, we have us some snow. SNOW! It's not slated to last very long but the girls sure do love it while it's here. Brilliantly awesome sauce Venn diagram, my teens approve too! 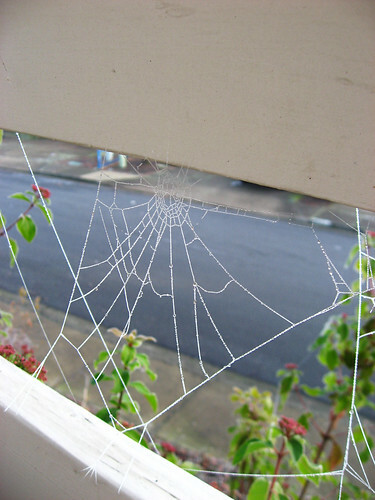 I love the look of the frozen spider webs, so delicate - glad you had a laid back chilled out holiday! my husband says that this needs to be a shirt. so now i'm hereby requesting it. 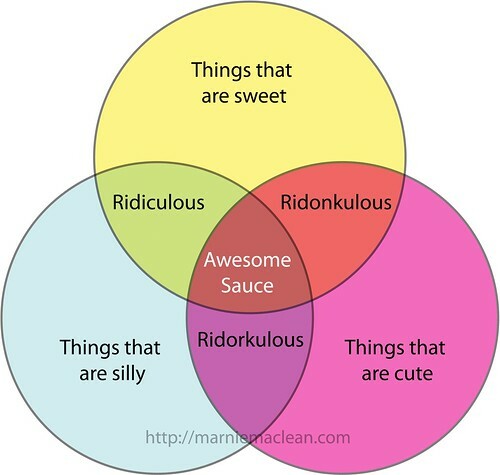 Your diagram is, of course, awesome sauce!! that last pics of the girls is SO awesome! 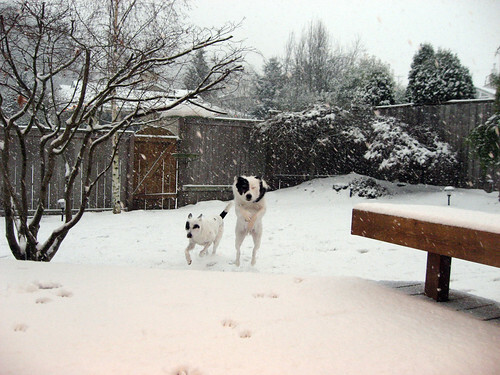 they look ecstatic about the snow! send some of that our way, will ya? :) Happy New Year to you, Leo and the doggers! 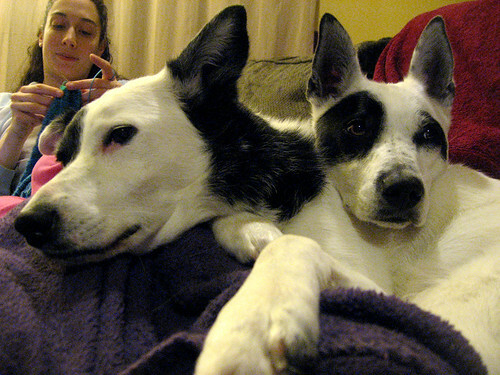 Your dogs always make me smile. They look like great friends. 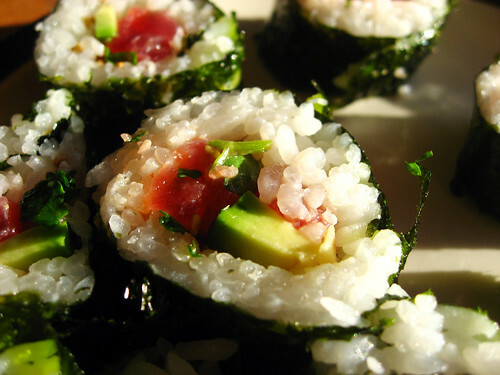 Sushi is THE favourtie food in our household! Happy New Year when it gets to you Marnie! The sushi looks so yummy! Last year, my husband gave me a basket for Christmas filled with a bunch of equipment/ingredients to make sushi. I was a little disappointed that I had to figure it out until I realized that HE was the one who was going to learn how to make the sushi. Finally, he makes me dinner ;) I will have to pass your recipe on to him. I, here in Northern Colorado, laugh at your snow. I laugh! BWA HA HA. We've already had more snow this year than any of the last six years. Luckily, I got a coat for Christmas. This page contains a single entry from the blog posted on December 29, 2009 4:18 PM. The previous post in this blog was Last little bit of 2009. The next post in this blog is The mother of invention.